This is an amazing time to be into games. More games, more types of games, across more platforms are available now than ever before. This month, it was announced that videogames, for the first time ever, have moved more units than any other entertainment industry. And today we learned that for this year's Webby awards, for the first time ever, a videogame publication has been included in the prestigious list of nominees for "Best Lifestyle" website. A list that includes the queen of all media, Martha Stewart. That's a lot of firsts, and combined they spell out in sky-high letters a truth that should by now be inescapable: Videogames are here to stay. They are a part of more lives than ever before, and more a part of those lives. Games affect not just how we play, but how we live, sleep, eat and breathe. For many of us, they are a lifestyle, plain and simple, but for far more people they are simply one part of that. A hobby they enjoy, and which, at this point in history, is finally one they can admit to enjoying with their friends. Friends who, for example, may spend their time being like Martha Stewart. This accomplishment, for a games media website to be ranked as high (and perhaps higher) as one devoted to all "good things" is an accomplishment of which every single gamer can and should be immensely proud, and all who create content about this gaming lifestyle can take home a piece of that award. It is unfortunate, for that reason, that there is only one name on the nomination. Yet it happens to be a name of which everyone at The Escapist is immeasurably proud. The website? The Escapist. Yesterday we were informed that The Escapist had been nominated in two separate Webby categories, for "Best Game-Related" and "Best Lifestyle" websites. Whether we will win the Webbys for those categories is up to the prestigious voting body of the International Academy of Digital Arts and Sciences. We hope they choose with their hearts as well as with their minds. We strongly believe The Escapist is currently the best gaming and lifestyle magazine on the internet, and think our chances for a win in either category are strong. Yet whether we win or not, it truly is an honor to be nominated. There's another award, however. Each year, the Webbys open up their awards categories for a People's Choice vote. You can help decide who wins the People's Choice awards in every category, but especially in those for which we are nominated. If you are a member or even a casual fan of The Escapist, we ask you to vote now and as often as you can for us. We're counting on you to help us bring home the awards. 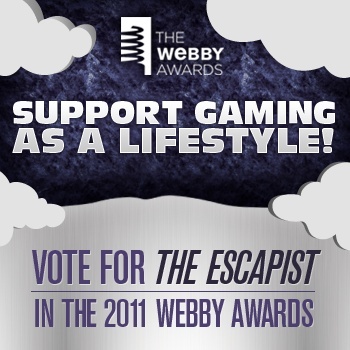 Even if you're not a fan of The Escapist, however, we urge you to consider voting for us in the "Lifestyle" category. A win for a videogaming publication in this category would send a signal loud enough to be heard on every corner of the web that games, as a medium, have arrived. That we, as gamers, will no longer be relegated to back rooms and lower rungs. That the medium we all so enjoy and that some look to as the harbinger of a sweeping change in how we see and interact with the world is ready to take its place as this century's most creative entertainment voice. A vote for The Escapist in this year's Lifestyle Webby category is a vote for gaming, pure and simple. If you love games, please vote for us. We'd do it for you. Vote for Gaming as a Lifestyle here. Vote for The Escapist in the Games-Related Category here.